Majestic Blooms. Sigh. They are so beautiful, aren't they? Karen B. from The Bald Dragonfly here today, excited to be posting my first card for Butterfly Reflections Ink! This card was so easy to put together. 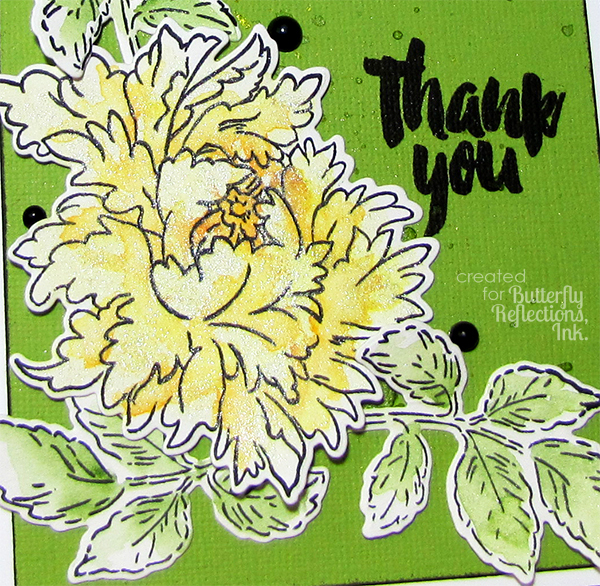 I started by stamping out the leaves from Altenew's Beautiful Day and the bloom from Majestic Blooms onto watercolor paper. After applying a coat of clean, clear water onto the images, I started coloring the bloom and leaves with a drop of Color Burst Metals-Saffron and my Kuretake Gansai Tambi Watercolors. After letting the flowers dry, I die cut them using the coordinating dies, Majestic Bloom Dies and Beautiful Day Dies. After applying a green cardstock panel with inked edges to a white card base, I flicked some water droplets onto the background (again with a drop of Color Burst Metals-Saffron and Kuretake Gansai Tambi Watercolors), stamped the sentiment from Majestic Blooms and arranged and adhered the flowers and leaves to the card base. The final touch was to create some enamel accents with Crystal Nuvo Drops in Ebony. Great news: almost all the items I used are in stock at the store! If you see something that is out of stock, I encourage you to click the "Put Me On The Waiting List" button so that Vanessa knows you absolutely need this item and try to order more! This is gorgeous, Karen!!! Love it! Swoon!! Love the fresh green background with your delicate soft yellow bloom!! This is spectacular Karen!! Well, you know that I love this Karen. Gorgeous card, love all the green!